Israel Finkelstein: Six long years. I hope to retire soon—if possible. You’re a young man. How old are you? An old man. I’m 53 and I should retire soon and write more. Well, David Ussishkin and I are going to continue the excavation at Megiddo. It’s an enchanting site. It’s been the cradle of archaeology in this country, Biblical archaeology if you wish. It’s providing us with a window into the history of this country. And there’s a nice swimming pool in the kibbutz. So I see no reason why not to continue excavating there. We have new insights in almost every spot we dig, almost every issue we touch on. We are excavating in six different fields. There’s a big advantage in going back to a site that has been excavated before, because you have these windows into the belly of the mound. And you can excavate at the same time in the Early Bronze Age, the Middle Bronze Age, the Late Bronze Age and the Iron Age. Starting from the Early Bronze I (c. 3500-3100 B.C. ), we are uncovering the largest temple compound ever excavated anywhere in the country from the entire Bronze Age—a monumental temple with evidence of animal sacrifice. Only one small piece of wall from that building was previously known. We opened the rest of the area. In Early Bronze I, Megiddo was the largest site in the country; it covered an area of between 50 and 60 hectares [between 120 and 140 acres]. It was a huge site, probably at least partially fortified. That tells you that as early as the fourth millennium, you probably already had some sort of territorial entity. You need a significant population in order to build a temple like this. You cannot establish something like this with only 300 or 400 people. You must have some sort of a central site with a countryside relationship. You already have some sort of evolution of a territorial entity, call it a chiefdom, call it an early city state, call it whatever you want. It’s the first time that we have, not on the level of theory, but on the level of what we find in the ground, definite evidence for something like this in the late fourth millennium B.C. The site also flourished in the Late Bronze Age (1550-1150 B.C.). The city was then destroyed at the end of the Late Bronze Age, in the 12th century B.C. This is what we may call Canaanite Megiddo. But, when the city recovered from the shock, from the destruction, it was still Canaanite in its material culture. Possibly one of the Sea Peoples. The Philistines? They were one of the Sea Peoples. Possibly. There’s no way of knowing. We don’t have an inscription saying so. Could it have been destroyed by another Canaanite army? It could have been destroyed by a neighboring city state, if you wish, but I think one of the Sea Peoples is the best candidate. Is there any possibility that the Israelites were the people who did the conquering? Well, not according to my point of view. I don’t know what an Israelite is in the 12th century B.C. In other words, archaeologically, you don’t feel you can identify an Israelite. Yes. If you think that a gang of ‘Apiru or Habiru, an uprooted population, or Shasu, or whatever, in the 12th century could be identified as Israel, and, that in the turmoil of the 12th century, they took over a city, then it’s a possibility. But I don’t believe in a functioning, coherent ethnic entity named Israel as early as the 12th century. When would you speak of such an Israel? I suppose that in the Canaanite highlands, there were groups who identified themselves as Israel as early as the time of the Merneptah Stela. You do have some people identifying themselves—or being identified by the Egyptians—as Israel. In the late 13th century, almost around 1200. The question, however, is not whether you have a group of people, ‘Apiru or Shasu, one of whom is called Israel. The question is when something larger and more significant grew out of that, something that has a territorial aspect to it. When we speak about a territorial entity, I would say definitely by the tenth century and possibly before. But how much before, that’s a big question. The Bible portrays mainly the realities of the time of its compilation (regarding the book of Joshua, the seventh century B.C.) and a little bit before. It also includes earlier material; there is no doubt about it. The Deuteronomistic history [Deuteronomy, Joshua, Judges, Samuel and Kings] includes material that reflects earlier memories. There is no doubt about that. How early, I don’t know. I mean these things are not reachable. They are beyond our knowledge. The Bible may even preserve some sort of a very vague memory or myth or folk tales about the turmoil of the 12th century. Who knows? I always say to my students that I will not go to court to say that there was a Joshua or an Abraham, and I will not go to court to say there was no Joshua or Abraham. There may have been some sort of a figure in the very ancient past. I don’t know. I can only tell you that the text we have reflects the realities and needs and, if you wish, also the propaganda, politics, ideology and theology of later periods. But archaeology has nothing really to say about whether or not there was an Abraham. You say you would not go to court on that question. Isn’t it true that archaeology is irrelevant to that question? Archaeology is almost completely irrelevant to that. Archaeology is relevant when somebody tells me that the patriarchal material in Genesis reflects the realities of the second millennium B.C. Then archaeology is in full steam to prove that he is wrong. Then, for instance, you can compare the names of the sites; you can go to the sites to see whether they existed at that time. There are things archaeology can contribute, but archaeology cannot recreate Abraham and archaeology cannot deny the existence of a person in the very early past. You wouldn’t expect to find in archaeology evidence of a particular family. Of course not. But the Bible in my opinion doesn’t give us any solid information about early Israel in the late second millennium B.C., except for possibly shreds of memories here and there, which I cannot trace. They are irretrievable. But what you just said is beyond your expertise as an archaeologist. Maybe you are right, but not as an archaeologist, not based on your archaeological knowledge. My dear Hershel, let me remind you that there are two approaches to archaeology. Some archaeologists see themselves as dealing only with material culture; and this is perfectly okay with me. I see myself, however, as an historian practicing archaeology. So I’m looking at matters from a completely different point of view. I’m trying to put together all possible pieces of evidence. Archaeology is one. And from my point of view, of course, it is a central one, maybe the most important one, but not the only one. I’m looking at the same time at the Biblical text, and at other ancient Near Eastern texts. Every text is biased, both the Bible and every other Near Eastern text. They are all written from a particular point of view. And the interpretation of archaeological materials can also be biased. And even with an unbiased approach, there are differences in interpretation of material culture. I agree. But again, if you ask me whether archaeology can prove or disprove the existence of a person named Abraham, archaeology is irrelevant. But if you ask me whether archaeology can or cannot shed light on a theory that the material in Genesis depicts realities of the second millennium B.C., then archaeology is very relevant. An earlier generation of Biblical archaeologists tried to show that the patriarchal age could be fixed, archaeologically, in the early second millennium B.C. This proved not to be the case. They were wrong. But that doesn’t mean that there were no patriarchs or that the Bible’s patriarchal narratives contain no history. It only means that we have failed archaeologically to place them in a particular period. At the end of the day, the patriarchal narratives reflect basically and mainly the needs, the ideology, the perspectives of the time of the compilation of the text. You keep coming back to the ideology of a later period when the text was composed, and I keep coming back to the questions that our readers are interested in, and that’s the matter of historicity. In the case of the patriarchs, people sometimes assume that because we can’t place the patriarchal narratives in a particular period archaeologically that there was no patriarchal age. But that’s not correct. There may or may not have been a patriarchal age. We just don’t have archaeological evidence to support it or disprove it. No, you are wrong, Hershel. The descriptions are fully immersed into the realities of Late monarchic times, into the toponyms of late monarchic times, into the states of late monarchic times, into the realities of the seventh, sixth and fifth centuries B.C. Since the patriarchal narratives are immersed in these realities, we have no reason to go and look for a patriarchal age. I look at it from the point of view of the composition; it does have importance, great importance and great beauty and great meaning and great value. The value is not whether there was or was not a patriarchal age and the value is not in historicity, either. The value is in the message that you have in the text. There is a historical value to the stories, but the historical value is at the time when the stories were put into writing. I have never understood why this history is less interesting than the history of something that may or may not have happened in the second millennium B.C. When people ask me what’s the difference between the way I understand the history of early Israel and traditional Biblical archaeology, I say there are two main differences. The first is that in the classical form of Biblical archaeology, archaeology was expected to decorate the story. Archaeology was not expected to give its own testimony. Archaeologists started their investigation from the Biblical story, and archaeology was expected to give some sort of illustration, nice slides for a talk. My opinion is that archaeology is not in the business of decoration of any text, a Biblical text or another text. Archaeology has its own voice. Archaeology speaks with real-time evidence, and in many cases it provides the most important testimony, sometimes the only evidence. And true, its testimony is sometimes problematic. I’m not saying that archaeology is free of problems and difficulties. The second difference is about the role of archaeology. In classical Biblical archaeology, the idea was that you followed the ancient history of Israel from early to late (in the Biblical order of events), with archaeology at times decorating and at times correcting the story. You start with Abraham and the patriarchs and then you go down to Egypt and then you have the Exodus, the Conquest and so on. My point of view is [and this is the main line of The Bible Unearthed, written with my friend Neil Silberman—I.F.] that you have to look at the history of Israel in the opposite direction, from late to early. From the Biblical text point of view also, you have to go from late to early: First, you understand the periods of the compilation of the text, and then you try to work back from that point into earlier history, in the opposite direction. I start with people who are interested in the Bible as a text. For example, whether the Red Sea parted is not a question of history, it’s a miracle. You either believe it or you don’t. It’s a matter of faith. It’s outside the function of archaeology or even of history to demonstrate that this happened or that it didn’t happen. I agree. It’s also beyond the reach of explanations that come from the realm of nature. If the Red Sea parted because there was this natural phenomenon, for the believer, that is blasphemy, because God’s power is enough to do whatever God wants without being explained later by all sorts of simplistic natural phenomena. On the other hand, someone may reason that the ancients understood a phenomenon like the parting of the Red Sea as a God-given miracle, when in fact there is a natural explanation for it. To such a person who sees this text as sanctified by time and as representative of an early people’s understanding of an event, they may ask themselves, “What inspired that understanding in ancient people thousands of years ago?” That is also a legitimate question. I believe there are no illegitimate questions, only illegitimate answers. To such a person, he or she may be interested in whether or not there was some natural event that the ancients understood as a miracle. And to such a person I say, “That’s a legitimate question.” It may not interest you, it may not interest me—or it may. Would you agree that that’s a legitimate question? Every question, almost every question is legitimate. I don’t want to go into the philosophy of whether every question is legitimate here. Getting back to the historicity of events in early Israel, I started with a miracle, the parting of the Red Sea. Let’s take another one: God told Abraham to “go forth to a land that I will show you” (Genesis 12). Whether God said that of course is a miracle. That’s beyond history. That’s a matter of faith. But someone may legitimately ask, did Abraham come from the east? Does archaeology have anything to contribute to that question? I’m not sure. I think the question should be, why did they tell the story in late monarchic times? That’s your question. That may not be someone else’s question. But the question before was your question. Who are you representing? The lawyer Hershel Shanks, are you representing the ancient people? No, I’m trying to understand your views. Okay, so I’m trying to tell you what my question is. You just told me a minute ago that every question is legitimate. Yes, your question is legitimate, too. But our readers would like to know whether archaeology has anything to contribute to my question. My method is to start with the question of why the story was told. What’s the purpose of telling this story in the text, a text that was put into writing only at quite a late date? Didn’t the people who put together the Biblical text use sources? They didn’t just make up a story, did they? Definitely not. Do you mean written sources? They had some written sources. How far back do the written sources go? Probably to the tenth century. Well, on that we don’t agree. Take the Book of Joshua, for instance. I cannot imagine the Deuteronomistic historian, who in my opinion sat in Jerusalem in the late seventh century B.C., inventing stories out of his imagination, to sell to the people as the story of the conquest of Canaan. Had he done that, he would have lost his credibility immediately. Definitely, the stories in the Book of Joshua must reflect some sort of traditions, memories, myths, local legends about the destruction of Canaanite cities. I’m not sure. What the ancient historian wants to do is to tell a story about the “early” history of Israel based on memories, but to present it in a way that will be useful for his ideology and theology. Is that right? I’m asking you. So the question then is whether there are written sources that he is using. And here I think we don’t agree. Here archaeology enters the story. The question now is whether there are written sources and how early they are. Yes, there are written sources, in my opinion. The answer is positive. I think so. The question is how far back they go. We need to look at Judah, right? I would say any sources. Okay, but we’re speaking mainly about Judah, because Judah is in the center of the whole thing. Judah is the place where the history is compiled. And Judah is also the center, from an ideological perspective. So we’re speaking about Jerusalem from the seventh century B.C., and whether there were written sources for the historian to use. You’re saying the final compilation of the text was centered in Judah, because Israel (the northern kingdom) had been destroyed by that time. Right, and also because the text reflects only the ideology of Judah. And then, since you have just mentioned the tenth century B.C., the question is whether the historian, when describing the time of Solomon, rushes to the archive in Jerusalem to ask for tenth-century royal correspondence or histories. The answer is negative. The ultimate compiler in Judah may have used Israelite sources, even sources from the United Monarchy. Israelite, yes. United Monarchy only according to your viewpoint, Hershel. I don’t think there are written sources from the time of the United Monarchy. Anyway, we look around to see, first of all, whether we have written material, in Israel or Judah, in the what, twelfth century, eleventh century, tenth century? When do we start getting a flow, a reasonable, a meaningful quantity of written material? This is related to a second question: When do we start getting a flow of official inscriptions, ostraca, etc., that may attest to literacy and real statehood in Judah? As far as I know, there is no evidence for meaningful writing in Judah, in Jerusalem, in Israel, before the eighth century B.C. Maybe ninth. Calm down, let me calm you down. I said, it’s possible. The Gezer calendar indicates that there’s probably a school. This is a schoolboy’s practice text. Yes, in the ninth century. Something is going on at Gezer and the Izbet Sartah inscription [a student’s practice text] is probably a bit older. So what? And I even think that there is a possibility that there were royal [Judahite] inscriptions in the ninth century. My friend Nadav Na’aman pointed out—and I think rightly so—that the [Biblical] story of the coup of Athaliah [c. 841-835 B.C.] and then the counter-coup of Jehoash [c. 835-801 B.C. ; see 2 Kings 11-12] comes from some sort of a royal inscription. It’s a possibility. Why not? But a full flow of writing you get only from the eighth century B.C. ; in fact, only in the seventh century. Also from the point of view of state formation and evolution of society in Judah and in Jerusalem, I don’t see a reality before the late eighth century B.C. when you would expect to have some sort of major writing industry, if you wish to call it that. This is after the time of the United Monarchy of David and Solomon. Yes, at least two centuries later. So you say that there was no state of David and Solomon in the tenth century B.C.? That depends on what the definition of a state is. We’ll talk about that later. What do you do with the texts in the Bible that are dated even before the tenth century B.C., even going back perhaps to the 12th century B.C.? Like Exodus 15, the Song of Moses (or the Song of Miriam if you want to call it that). I am not expert on this. I don’t want to speak about it [though the two are considered by some to be of different source and age—I.F. ], but personally, I do not think that there is in the Hebrew Bible written material that can be proven to be earlier than the ninth or eighth century, except for vague memories, myths and folk tales. You’re speaking about written material, aren’t you, Hershel? I’m speaking about a particular poem, in Exodus 15, which Frank Cross [of Harvard], for example, and other leading philologists and experts in the history of language date to that very early period. But there are other leading experts who say different things. It’s like the question as to whether material in the book of Samuel contains written material from the tenth century B.C. Your colleague Baruch Halpern believes that it does. I know. And then [John] Van Seters [of the University of North Carolina] comes and says something completely different. Wouldn’t it be relevant to your inquiry whether the Song of Moses had been written out in that early period? I don’t remember the Song of Moses, but I know the Song of Deborah [Judges 5], which is also early. I find it extremely difficult to buy this—that you have 12th or 11th century B.C. written material in the Hebrew Bible. There is no evidence of that whatsoever; not a single inscription. Don’t you think the Song of Deborah is early? I don’t think it’s as early as that. There may have been oral transmission, but I don’t think that it depicts a real, historical situation of the 12th century B.C. That’s a question that’s really central to your inquiry, isn’t it? And I am answering you. Shall we get back to the question about the United Monarchy of David and Solomon? You said we’d come back to that later. Okay, let’s talk about the United Monarchy. I see the fire in your eyes, Hershel, that you want me to speak about the United Monarchy. How can I let you down? You traveled all the way from Washington to Tel Aviv to sit with me and talk about the United Monarchy. Ask me, please. Well, there are a couple of questions. Of course, the historical question relates to whether the United Monarchy existed, whether David and Solomon ruled over a united Israel, and what the nature of this entity was—a state or a chiefdom or some other kind of entity. And of course this relates to the question of your now-famous low chronology, in which you date things that were traditionally dated to the tenth century B.C. down to the ninth century B.C. According to you, what was traditionally considered the poor material from the 11th century B.C. now becomes tenth century B.C., the period of the United Monarchy. So we want to see if we can explain to our readers this so-called low chronology of yours. Let me start by saying that I see myself as a scholar standing somewhere in the center between the more conservative camp, on one hand, and the more critical camp, on the other. Being in the center is a very tricky business. If you stand on one side, you are attacked only from one side; but if you are in the center, you are always being attacked from both sides. So sometimes some of my friends from the more conservative camp accuse me of belonging to the more nihilistic approach (or the very critical approach), denying the existence of the United Monarchy. This is not the case. For many reasons I do not deny the existence of David and Solomon. The Tel Dan inscription is one of them. There was a memory already in the ninth century B.C. that the founder of the dynasty in the capital of Judah was a person named David. I do not deny the existence in history of a David and a Solomon. I must put this on the table, once and for all, in order to make things clear. However, I definitely have a different view on the extent, on the nature of the entity which was centered around Jerusalem in the tenth century. There was something there in the tenth century, but exactly what it is is the big question. In order to understand what was there in the tenth century, we have to go back to the matter of dating. In Jerusalem itself, regardless of the low chronology, we are in an extremely difficult situation. I’m not saying that there is nothing from the tenth century in Jerusalem. But whether you go with the low chronology or a more conservative chronology—the more conventional dating of 10 or 20 or 30 years ago or for many people even today—you are still in big trouble, because you don’t have real monuments in Jerusalem from the tenth century. You definitely have [pottery] sherds. There definitely was a settlement there in the tenth century, but it was not the monumental, glorious, illustrious city described in the Bible. The conventional dating that we have been using—I’m not using it anymore, but many scholars are—is the system that was established mainly on the theory of Yigael Yadin based on the results of his excavations at Hazor and Megiddo. Yadin did a great job excavating at Hazor and a great job at Megiddo as well. You and I both knew him very well. He was a great scholar. There’s no doubt about it, really brilliant. In the 1960s and the 1950s there was probably no other way to describe the finds at Hazor and Megiddo other than the way Yadin described them. We cannot judge Yadin now from the point of view of what we know in 2002 and go back with this knowledge and try to impose it on the 1950s at Hazor. Yadin stated that he had dated Stratum X at Hazor and the contemporaneous material at Megiddo to the tenth century based on stratigraphy, pottery and then the Biblical text. But in my opinion, he based it only on the Biblical text. Stratigraphy doesn’t give you a date; it just tells you what’s early and what’s late. Pottery? I have not seen a sherd with a label, “I was made by Solomon.” Maybe you have. Have you? Good. So then the whole business of archaeology is to find a way to tie the relative chronology that we have established, from pottery and stratigraphy, to tie it into a system of absolute chronology. How do we do that? In the 12th century B.C. there is no difficulty because you have strata with Egyptian monuments mentioning Ramesses III. [This gives us an absolute date because we know when Ramesses III lived—c.1184-1153 B.C.—Ed.] Basically, we know where we are. In the eighth century B.C., we are in the same situation. We know where we are because we can identify the Assyrian destructions of Tiglath-pileser III [744-727 B.C.] at Megiddo in the north, of Sennacherib [704-681 B.C.] at Lachish in the south, etc. The question is what we do about the eleventh, tenth and ninth centuries? In these centuries there’s no way to tie the relative chronology to an absolute scale. There is the Shishak stela at Megiddo [dated by most scholars to about 925 B.C. ], but it was found in a dump [not in a stratified level]. The same kind of thing is true elsewhere. So the only way for Yadin to establish an absolute chronology was to look at the Bible. There was no other way in the 1950s. So he came up with this idea: You have similar gates at Megiddo, Hazor and Gezer. And the Bible says that King Solomon fortified these three locations (1 Kings 9:15). Solomon lived in the tenth century. Therefore the strata with these gates must date to the tenth century B.C. This whole paradigm is based on a single Biblical verse, 1 Kings 9:15. But this verse may reflect a reality different from the time it describes. It was compiled in Jerusalem in later times. Whether it describes a memory from the tenth century or whether it reflects a memory from the eighth century or the ninth century, we don’t know. Now, almost 50 years later, when we look at this, there is ample evidence coming from different directions to tell us that something is wrong here, really wrong. First of all, you have wider theoretical, historical questions that need to be addressed, for instance whether Jerusalem—possibly a limited village at the time, not a very significant settlement, not a very elaborate one—could be the capital of a United Monarchy extending over the northern part of the country, with its palaces at Megiddo, not in Jerusalem. It’s a question that must be addressed. Then you have evidence of state formation in the Levant, the western part of the ancient Near East. If you look at Moab, Ammon, Aram Damascus and the northern kingdom of Israel, you see that they developed into real states only in the ninth century B.C. That does not mean there could be no great state before them—in the tenth century. But we need to remember that if you say there was a great state in the southern Levant in the tenth century B.C. centered in Jerusalem, then it’s the only one; it’s unique, and it left no evidence. Other peoples in adjacent regions did not reach the level of state formation at that time. Is that possible? Yes, it is possible, but it’s highly unlikely. This is just one set of questions—there are many others—that lead me to the conclusion that the conventional dating must be rechecked. Then, we have more direct evidence that cannot be brushed under the carpet. The first one is the similarity between the pottery assemblage from Jezreel, which was destroyed apparently in the middle of the ninth century B.C., and Megiddo, which according to the conventional theory was destroyed in the tenth century. There’s a problem there—the two assemblages are identical. In my opinion, the only way to deal with this is either to pull one down or to push the other up. Pushing Jezreel up to the tenth century is not an option. Then there is the similarity in architectural details between the palaces at Samaria (clearly ninth century B.C.) and Megiddo, conventionally dated to the tenth century. Again, you either have to push one down or pull the other up. There’s no way to pull the palace at Samaria up to the tenth century. The only way is to push the palaces at Megiddo down to the ninth century. Some of my friends tell me, “Here you are in a trap, Israel. How can you accept the Biblical text ascribing the building of Samaria to the [ninth century] Omrides, yet reject the Biblical text ascribing the construction of Megiddo to Solomon?” This was the question of Hershel Shanks also. Here’s the answer: Whoever asks a question like this does not understand the meaning of Biblical studies in the last two centuries. The study of Biblical history is all about sorting history from non-history; accepting one verse and rejecting another. As for Samaria and the Omrides, on the one hand, and Megiddo and King Solomon, on the other, there are several reasons for a difference. There’s a big difference between the tenth century B.C. and the ninth century in our historical and archaeological knowledge. In the ninth century, we have evidence for the greatness and the strength and the prosperity of the Omride dynasty in the northern kingdom of Israel. We have the Assyrians referring to the Omride state as Beit Omri, the house or land [dynasty] of Omri, which means they knew there was a monarch named Omri who was the founder of the dynasty and the founder of the capital. So in my opinion there is ample evidence that comes from both extra-Biblical texts and archaeology for this understanding of the Biblical text. So you depend on the Biblical text for dating the palace at Samaria? Not necessarily, but why not? I’m not rejecting the entire Biblical text. I’m a Biblical archaeologist, Hershel. Well, I can see now that this will be the title of the interview. 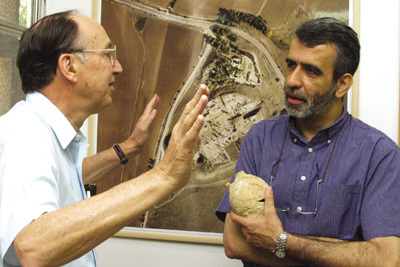 “‘I am a Biblical archaeologist,’ says Israel Finkelstein.” You see, I gave it to you. But it’s different with the stories of David and Solomon. With the Omrides, the text and the archaeology support one another, so why not use the text? Whoever tells me that I have either to accept all the Biblical material or reject it all is talking nonsense, in my opinion. Then there’s the question of carbon 14, radiocarbon dates [of organic material found in excavations]. I think that at the end of the day, this will give us a verdict on the chronology, in maybe 20 years. Not now, because for the time being we don’t have enough samples, and we are still far from agreement on the interpretation of the results. When you say we may have a verdict in 20 years, does that reflect your own uncertainty or are you saying that you will be shown to be right? No, what I’m saying is, that for the time being, the results from Tel Dor, even from Tel Rehov and from Megiddo, support the low chronology. It’s more probable, but it’s not definite. It’s not the end of the story. For you, is it an open question as to whether the low chronology is correct, or are you certain it’s correct? You are stepping into a trap. I’m warning you. Many of your remarks seem to be addressed to the fact that I oppose your views. My purpose here is to allow you to expose your views to the readers of BAR. So okay, I’ll step into your trap. Why is it that so many leading scholars do not accept your low chronology—Ephraim Stern of Hebrew University, Amnon Ben-Tor, also of Hebrew University, Amihai Mazar, also of Hebrew University, Americans like Lawrence Stager of Harvard, Seymour Gitin of the Albright Institute in Jerusalem, Timothy Harrison of the University of Toronto. Even your close colleagues at Megiddo, David Ussishkin of Tel Aviv University and Baruch Halpern of Penn State University, have not come out in favor of it. They take a more stand-offish view. How do you account for this? Is it that they are obtuse, or have they some motive? What is the source of this intense disagreement? There is a difference between intense disagreement and a list of names. It’s a funny question, I must say. It’s the funniest question you have asked me today because it’s not relevant whatsoever. If I’m right, I’m right; if I’m wrong, I’m wrong. It’s irrelevant that X and Y and Z and A and B and C are against me, and D and E and F and G and H are for me. Ten years ago there was a great debate in the archaeology of the Levant about the beginning of the Middle Bronze Age. One scholar argued for one position; the other scholars argued for another position. When all the ammunition was presented by the lone scholar who argued for an earlier date, the final doomsday weapon was to say that this scholar was wrong because everybody was against him. Ten years later, the scholar who stood alone was proven right. And the scholars who accused him for standing alone were proven wrong. What does it mean? It means nothing. There’s no relevance to this question whatsoever. But I’m ready to play your game. You are right about one thing here, that it’s a very complicated matter. In my opinion, Hershel, the number of people who really understand what this is all about—not in slogans, but who are really ready to go into the nitty-gritty of the pottery and the texts and the architecture and the scarabs, and the paleography—is extremely limited—maybe 20. You can judge only according to those people who publish articles about this debate, not people who say in an article yes, I support it, or not. In an article that is going to be published soon in BASOR [the Bulletin of the American Schools of Oriental Research], I give a temporary list of those who support the low chronology in one way or another. It’s a very long list, Hershel. [Since you mention names, let me do the same. The list includes Lily Avitz-Singer, Alexander Fantalkin, Norma Franklin, Ayelet Gilboa, Axel Knauf, Stefan Munger, Nadav Na’aman, Michael Niemann, Tali Ornan, Benjamin Sass, Ilan Sharon, Christoph Uehlinger, David Ussishkin, John Woodhead and Orna Zimhoni—I.F. ]* So in my opinion, I am in the majority. You simply have not acknowledged that yet. You have not understood what’s going on. If you take away all the declarations and all the big names, all the small names and whatever, and you really look at people who publish articles on one aspect of the debate or another, either on the pottery or about the architecture or about the stratigraphy, I seem to be in the majority. There is support for my view on the basis of history, on the basis of paleography, on the basis of amulets and scarabs, and so on, from every point of view, from every angle. Some of my opponents are great scholars, and they do publish, so I accept them fully, and their view is extremely important to me. They are real scholars who know exactly all the small details of this debate. But the number is extremely limited. Incidentally, you, Hershel, think that the world, the entire world, is centered in one place in this country, and maybe one place in America. But the world is more complex than that. You mean Jerusalem and Harvard. I don’t mean anything, I’m just describing your point of view. I will name one other place. It’s not an important place. Negligible, on the margin. No real education there, no scholarship, no history writing, no Biblical history or criticism there. But maybe it is a little bit important. Its name is Europe. Have you heard the name Europe? Europe is the place between the two places, one in America and one in this country, and over there, for instance, I’m definitely in the majority. So what does that say? Does it say that I’m right? No. It doesn’t mean that I’m right. But I’m not impressed by any list of supporters or opposers. I am impressed only by evidence. And I must tell you that I am definitely impressed by the evidence provided by some of my opponents. Some of them are doing a great job, and putting on the table new material, which is extremely valuable. Would you name those people? Amihai Mazar, for instance. He’s a great scholar who really understands the problem, including the smallest detail in the debate. I’m not going to go farther than that. There are people who really understand the nitty-gritty, and I respect them. I oppose them; we fight each other in writing; we debate each other in lectures; but I hope that we respect one another. I definitely respect them. At one point I remember your saying that Ami Mazar was halfway to your position. Do you still maintain that? Well, you have to ask him. I think so. Well, I cannot speak for Ami Mazar. You have to speak to him. But the way I understand his position is, first of all, he understands that there’s a real problem with the conventional chronology. Secondly, I think he would admit that some of my arguments are strong and should be addressed. He has published scientific articles on several issues related to the debate, and has provided new information, not only saying, you know, X and Y and Z and D and F are against him, and that’s why he’s wrong. You’ll never get this from Mazar. This is not scholarship, it is name-dropping. What’s the meaning of “controversial scholar”? The meaning is you disagree with me. I’m not talking about my view: I’m talking about the world of scholarship. One of the things we haven’t spoken about is the debate in Biblical studies between the so-called minimalists and the maximalists, the minimalists being the people who tend to deny the historicity of the Bible in general. They’re broadly represented by a group in Copenhagen, Denmark, and in Sheffield, England—Niels Peter Lemche and Thomas Thompson from Copenhagen, and Philip Davies and Keith Whitelam, for example, from Sheffield. I know that you are offended sometimes because you are lumped with these minimalists. I don’t believe I have done that, but it’s often done. I was looking at something from a very respected European archaeologist who recently wrote in a very obscure German publication about the utter skepticism “of the Biblical tradition” by those called “minimalists.” And then he puts in parenthesis the names of Lemche and Thompson, and, “from an archaeological angle, I. Finkelstein.” Now, I assume that you would disagree with this, that you are not a minimalist, yet things like this get into print. There are many such instances. I wonder if you would explain your position. First of all, you, Hershel, play a major role in the incitement. You have to admit this. You play a really important role in inciting people against each other. I respect and have respected a lot of what you have done throughout the years. But there are points that I don’t respect. You know exactly what they are. We have known each other long enough to know where we disagree. The only problem in the last year or two has been that I felt that the disagreement between the two of us got a twist into a hostile direction that really surprised me. But let’s put this aside for a minute. It’s not a matter of being offended or not. I am not offended by being put with the minimalists or with the conservative people. The only question is whether my positions are being portrayed properly. I think that the minimalists—the people you call minimalists—are good scholars, and they are important scholars, and they have contributed a lot to historical and Biblical scholarship. We have to listen to them carefully, even when they are wrong. Sometimes they are right. It depends on what, it depends on where; but they have steered this debate—which is a positive debate, an important one. Whatever the verdict is, the debate is important, and the debate is there, thanks to their publications. So we have to be very grateful for their publications. This has nothing to do with whether I agree or disagree with them, but I respect them and I respect their scholarship in the same way that I respect good scholarship from the conservative side, so it has nothing to do with being offended, this way or that way. In any event, I think that I stand in the middle. When we speak about right, left or middle, we are speaking about the history of Israel. When we speak about the history of Israel, we are speaking about the text of the Bible. I stand in the middle. On one side you have the conservative camp, which follows basically the lines of the Biblical description of the history of Israel, from early to late. On the other hand, you have the minimalist camp. They argue that all or most of the material is Persian or Hellenistic [fourth-third centuries B.C. ], and it has nothing to do with the real history of early Israel. What they are saying then is that the text was put in writing in the Persian or Hellenistic period and therefore has no value for understanding the history of Israel in the Iron Age. My position lies between the two. What I’m saying is—and I’m not alone here—that the material was put in writing in late monarchic times, and that it reflects the realities of late monarchic times (the seventh century, possibly also the eighth century B.C. ), and that there is earlier material which found its way as memories into these texts. That is why I don’t think that you can put me either with this group or with that group. And the center camp is a big camp. You guys—and here I’m talking to you too, Hershel—you have always tried to eliminate the center camp, or you have ignored the center camp, or you have twisted the ideas of the center camp. But the center camp will prevail. There are many scholars in the center camp—in this university, in America, in Europe, in Biblical studies, in archaeology, in history. Why eliminate it? Why describe me as minimalist? With all due respect to the minimalists, I’m not arguing for a date of the text in the Hellenistic period. I’m not arguing for a text that reflects the tenth century B.C. either. So, I’m not offended. I just want my views to be properly portrayed. Please try to respect this modest wish of mine.